This is a card I made a while back. 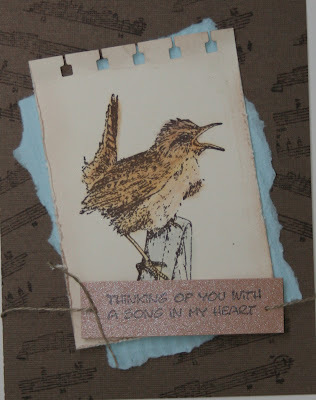 I used the Marsh Wren from Sparkle n Sprinkle for the main image. I stamped in Brown Stazon and watercolored it and used the spiral punch (SU) on the top. I sponged the edges with Close to Cocoa and roughed up the edges with my cutter kit (SU). That is layered on a torn piece of Bashful Blue. Music Scrap was used on the background stamped in Chocolate Chip on the same cardstock. The verse is stamped with Chocolate Chip on some metallic paper I had laying around and put on with dimensionals with linen thread tied around. Well I'm off to Tallahassee for the weekend to see a good friend and stamp the weekend away. I will show you what we did when I get back.